We arrived in beautiful Fiji on May 22, 2015, and in only a few more days, we would have been here for 18 months. The law here states that we can visit for 18 months, but if we stay longer, we must pay duty and import the boat. That means it is time to go. We had planned to head west to Vanuatu and on to Indonesia, but time has run out for that long trip. 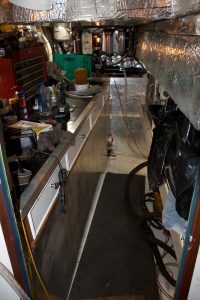 The last part of our big refit of Learnativity was remodeling of the enormous standing headroom engine room, including the addition of insulation, replacing floors and the workbenches, remounting of all the filters and pumps, and redoing plumbing and electric to the main engine. Like all things on boats, this took longer than anticipated and before we knew it, October had run out. As Wayne says, we live on the ‘No Plan Plan’ and we have quickly pivoted and pointed Learnativity‘s bow towards New Zealand. I am thrilled with this change in plans. I was last in New Zealand during the 1975-1976 cyclone season, and I imagine the place will have changed a bit. Before taking off on a passage, we had to get out and do some sea trials after our long refit. 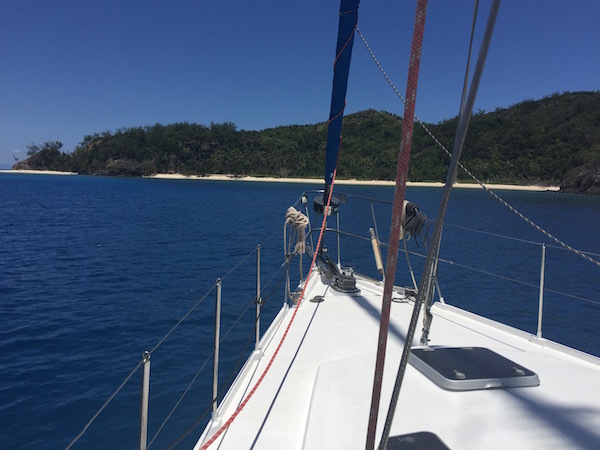 After all this time in Fiji, I got to sail out to Musket Cove on Malolo Island for the first time. It’s one of those cruiser hangout spots which I wanted to see in case I write about this place in a book sometime, but we only stayed there one night. 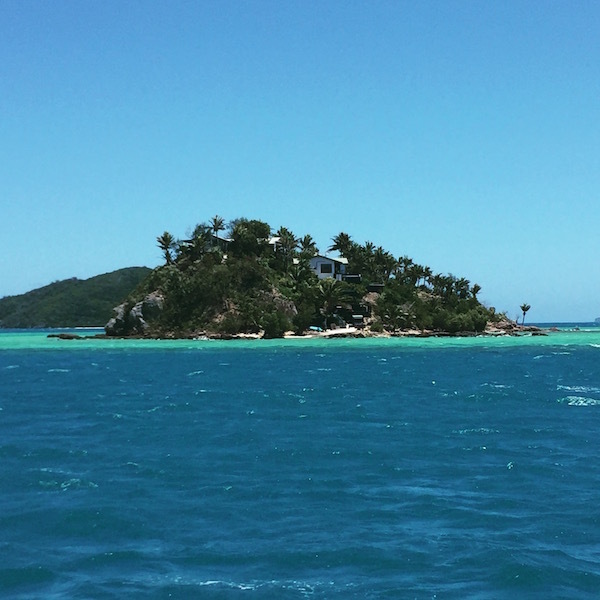 Then we sailed out the north end of the reef passing this lovely little private island. From there we continued to the uninhabited island of Navadra which is the first place Wayne and I sailed to when we first met in 2013. There we scrubbed the bottom of the boat and took the dogs ashore to run on the beach every day. It was great to be out of the marina and back to the cruising life once again. Unfortunately, New Zealand has very stringent rules for importing pets and we are planning to fly home for a while, so we decided to once again leave our pups in Fiji with their favorite dog sitter. We will pick them up when we fly out of Auckland en route back to the states. In the meantime, I don’t know what we will do without our sea dog standing an alert watch to protect us from bad guys. We have had such a great time in Fiji in spite of the fact that we spent much of the time hauled out in the boatyard. 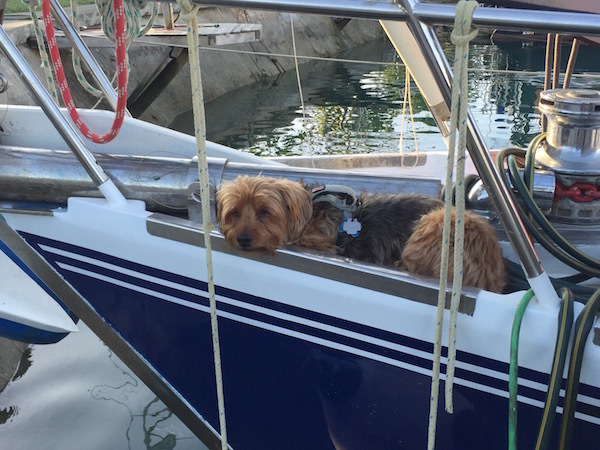 There was the time the famous sailor Steve Dashew visited Vuda Point Marina in his new FPB 78 Cochise and Barney and I paddled out in the kayak to check out the boat. Steve was kind enough to chat with us for nearly an hour. We talked at length about the changes in lifestyle for sailors like us who switch to power. I was very grateful to have that time to pick the brain of the guy who inspired us to make the move from sail to power. 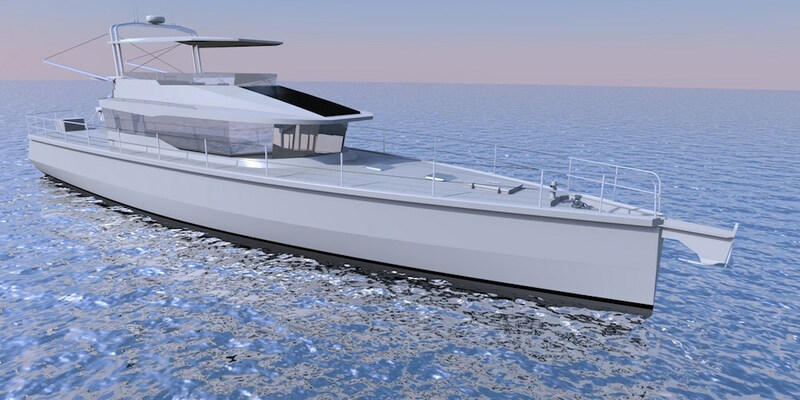 The new long range power boat that Wayne and I are planning to build will be in this family of vessels like the Dashew FPB boats, but we think it is a much more handsome design thanks to our talented designer Dennis Harjamaa of Artnautica Yacht Design. We don’t think these type of boats are really trawlers because they have long slender hulls more like sailboat hulls. Hopefully, they will come up with a name for them one of these days. Part of our design criteria is that we wanted a displacement boat that looks sleek and a bit military, is capable of 11 knots, and has a range of 5,000 nautical miles at that speed. We are still in the design stage and we have no idea when we will start building, but it has been lots of fun working on the 3D model. Below is a rendering of the boat we plan to build. We are now saying goodbye to Fiji. We have no idea when we will be back to this country we have come to love, but we are taking away so many wonderful memories. The staff at Vuda Marina always sing for departing boats, and after all these months, yesterday it was our turn. Sota talay, Fiji. See you later. It must be bittersweet to leave Fiji, and soon say adieu [hopefully temporarily] to the pups. I visited New Zealand a few years ago and was thoroughly enjoyed our stay. Hope you enjoy it there. More recently, hubby and I spent a couple weeks on a passenger motor sailing yacht on the Dalmatian Coast of Croatia. We were paying customers, but got a taste of the life. I know Croatia and the Adriatic is a long, long way from the Pacific, but oh my, it is a yachtsman’s paradise. The waters are crystal clear, the ports of call historic and beautiful, the people so friendly and open. When you build your new vessel, give a thought to sailing in that region. Really kinda sad, I think. Even with your haul out, you’ve still managed to have some good adventures. Be tracking you as you go; hopefully you will have some time on this long voyage to do some writing! Been missing that, with all your travels! Oh no! You left your dogs in Fiji, but then say you “have no idea when you’ll be back”! I hope I’m missing something here – can’t imagine leaving dogs behind with no plan to return, but … sigh… maybe that’s just me. Dogs are family and don’t get abandoned any more than a two year old child would be. Other than that, sounds like a fine adventure and lovely boats all around! The way I read it they will stop over there to get the dogs on the flight home to the US where she said they will stay for awhile. The ‘don’t know when they’ll be back’ to Fiji I interpreted as on their next cruise. Hope that’s right! We have arrived in New Zealand, and I am now able to read and reply to comments here. Indeed, as San notes below, I wasn’t counting a day’s layover to pick up the dogs as a real return to Fiji. 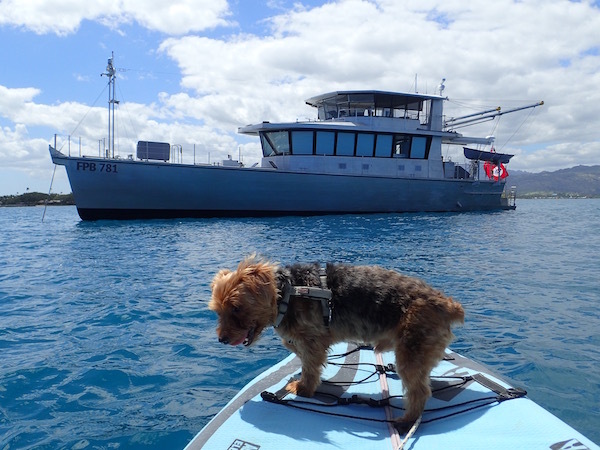 I know we will be back to pick up our pups before the year is out (trust me, our puppies are like our kids), but I don’t know when we will return to Fiji on our new boat. Just finished reading Knight’s Cross last night and it was wonderful. Can’t wait to see where you take us next. 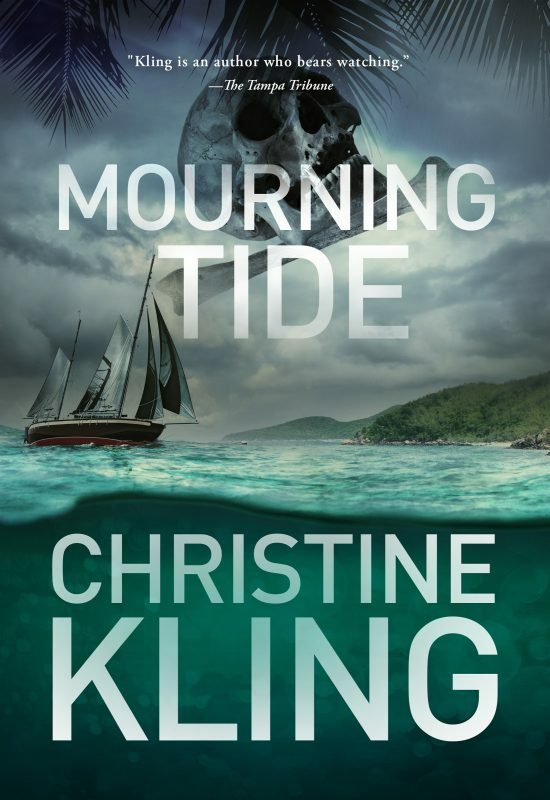 Look forward to seeing your boat in North Cove Kawau Island, I’m a big fan of your books Christine. Steve Dashaw anchored in here for a few days during last summer and we know Dennis. Fair winds and safe journey down to NZ. Safe travels! May your new boat bring you ever more joy.